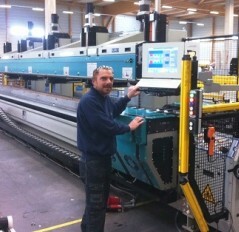 The Aluroller EVO ensures that every assembled profile is straight, starting with the very 1st profile. The result is that your waste can be reduced to 0, and customer complaints re: quality will drop dramatically. The fast set-up times and extremely high efficiency allow for fast production times and easy switch-over between batches. You can quickly shift from one profile type to the next. Each half of the profile is clamped in separately, over its entire length. The profiles remain clamped in during the entire process. As a result, every single profile that is assembled with the Aluroller EVO will be poor of any internal tensions. A straight profile, as from the very 1st profile. The 3-in-1 technology of the Aluroller EVO allows for less internal logistic handling, less damage, less costs and less personnel. Moreover, the user interface and machine set-up allow for extremely fast set-up. 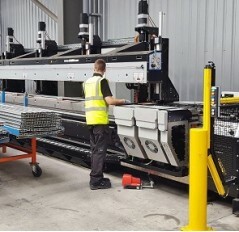 All sorts of profiles can be assembled: extremely long (up to 7500mm*) and wide (up to 500mm) profiles, cascade profiles, asymmetric profiles or complex profiles. Large isolation strips are easily inserted, without being blocked. The Aluroller EVO will allow you to optimize your production process by eliminating all tasks that do not create additional value. 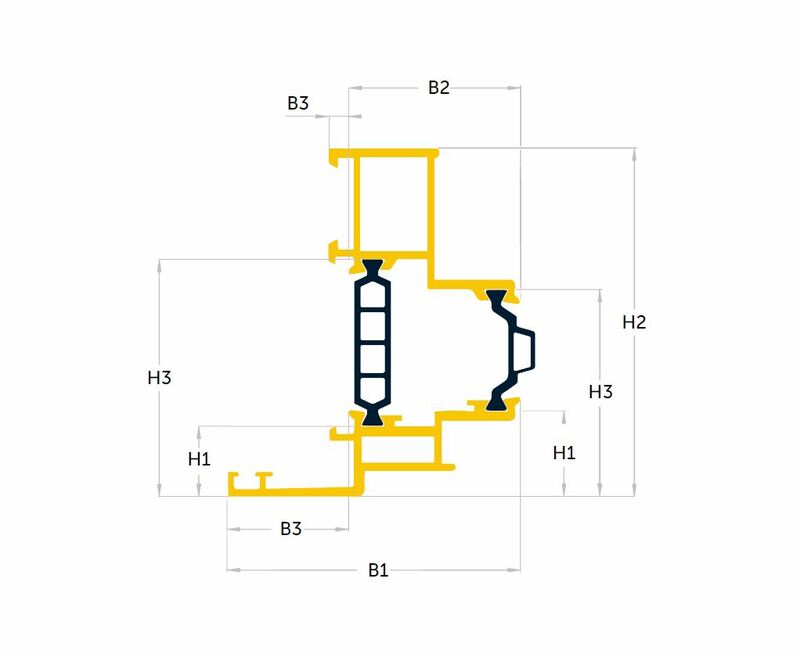 Level scheduling, quick changeover processes and standard processes regardless the profile type will enable a continuous flow in your production. Since every assembled profile is straight, your waste is reduced to 0, significantly impacting the profitability of your business. Traditional isolation strips as well as foam strips can easily be inserted in 1 single process. The end result meets the highest European quality standards, which allow you to set premium pricing. Costs can be saved on floor space, internal logistics and personnel. Less tooling is required and maintenance is limited during an extremely long lifecycle. With the lowest cost per meter in the market, ROI is less than 1 year. The nature of the supply chain has undergone significant changes in the past years. Series sizes have decreased, and we need to be able to react quickly to sudden changes in demand and supply. Thanks to the fast set-up times that can be achieved with our user-friendly user interface and machine set-up, you can easily switch between different profile types, without impacting the output of your production process. We all long for a greener planet, not in the least the end consumer. At ALURO, we have invested to ensure that our technology meets the latest ecologic standards that decrease your ecological footprint. Not only do you produce less waste with the Aluroller EVO, you will also be using less energy since you will be using only 1 machine instead of several machines. Moreover, we have used technology in our Aluroller EVO that re-uses energy thanks to advanced steering techniques. Think ahead, and anticipate the newest profile types that the market is already developing today.We have worked closely with both profile designers and producers and with the suppliers of isolation technologies. The Aluroller EVO allows you to assemble the most innovative and complex profile types, also with varying isolation types, such as foam or open and closed cell structures. Complex profiles, extremely long profiles or even cascade profiles can be assembled without problems, and will result in a straight profile. Every single time. Starting with the very first one. ALURO has been servicing customers in over 25 countries all over the world. For over 25 years. And we will continue to do so. At ALURO, the customer always comes first. Together, we will ensure that you get the most out of your machine, at a minimal cost. Our multilingual service team will assist you remotely when possible, at your premises if needed. Our technology allows for remote diagnostics, which will improve the service. And decrease your costs. To ensure that your operators can operate your machines during long shifts, we have made every possible ergonomic improvement to the ALUROLLER EVO. The Lift-Assist, for example, will position the upper profile half for your operator. So they won’t need to bend or force their back. Knurling, strip insertion and rolling (or crimping): the Aluroller EVO carries out 3 operations. With just 1 machine, and only 2 operators.